WASHINGTON (CNN) -- The U.S. military is tracking a North Korean ship believed to be carrying illicit weapons or technology, a senior U.S. official said Thursday. The Kang Nam is known for having carried "proliferation materials," a senior U.S. official says. The ship, the Kang Nam, is a North Korean-flagged ship, according to two senior U.S. officials, and is currently in the Pacific. While the United States does not know what specifically is on the ship, the Kang Nam is a "repeat offender," known for having carried "proliferation materials," one senior defense official said. 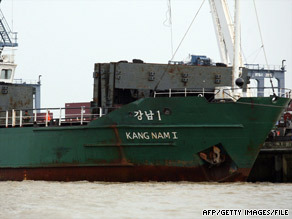 Without speaking to any details of the Kang Nam report, Adm. Michael Mullen, chairman of the Joint Chiefs of Staff, said Thursday that the United States would not forcibly board a North Korean ship but, in accordance with the recent United Nations resolution, would request permission to search the ship or press any port the ship docks in to inspect it for illegal materials. Mullen told reporters at a news conference that neither the United States nor any other navy would board a ship without permission. "The United Nations Security Council resolution does not include an option for opposed-boarding or noncompliant boarding with respect to that," he said. "We expect compliance." North Korea has warned that any effort to stop one of its ships would be considered an act of war. "To further isolate itself, to further noncomply with international guidance and regulations in the long run puts them in a more difficult position," Mullen said.